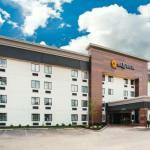 Offering free breakfast and Wi-Fi and year-round swimming the non-smoking La Quinta Inn & Suites Cincinnati NE - Mason is a satisfying economy option for a business or family stay. This La Quinta Inn & Suites is a mid-rise hotel boasting pillowtop beds hairdryers coffeemakers flat-panel HDTVs with game consoles and plug-and-play features and free Wi-Fi in all 90 non-smoking rooms. Guests start the day with a free newspaper and a buffet of waffles muffins cereal and more before heading off to meetings or to the Kings Island Amusement Park. The atrium hosts a heated indoor pool and a hot tub make kicking back a breeze. The hotel also offers self-service laundry facilities and free parking. Pets are welcome at no extra cost. The La Quinta Inn & Suites is loff I-71 in Mason 19 miles north of downtown Cincinnati and 11 minutes from the Kings Island Amusement Park which features the Nickelodeon Universe and the 45-hole Jack Nicklaus Golf Center. Abundant shopping dining and entertainment options are offered at the Deerfield Towne Center about four minutes from the property. The University of Cincinnati is 24 minutes away and the hotel is 33 miles from Cincinnati-Northern Kentucky International Airport. Dogs of all sizes are allowed. There are no additional pet fees. Dogs are allowed in smoking rooms only. Dogs must be leashed, cleaned up after, and crated or removed for housekeeping. Pets are allowed in smoking rooms only.